crafters had already started sharing their projects, and chatting. Facebook, and I wasn’t sure if there was room for another one! easy to remember Happy Crafting! whirly-type flowers that had first caught my eye! flower image is that it has some solid small flowers/berries included with the flower and leaves. flowers/berries would be solid black! Marker Pens, huffing on it and them stamping! surrounding stamps in Emerald Envy Ink. – and then the stem with small flowers/berries, definitely not so easy! 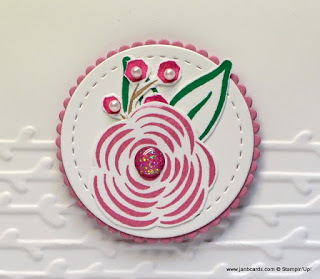 centre of the top layer, which was Whisper White Cardstock (CS). with the images, I realised I wouldn’t have room for the sentiment. Dimensionals sat either side of the ribbon. in the centre of the little flowers/berries. the stem and small flowers/berries, painted the same way as earlier. also repeated this twice more to stamp inside the card. 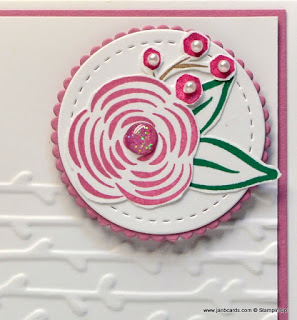 This is a very clean looking card and I enjoyed making it, but it’s not for someone whose in a hurry, or someone who doesn’t like fussy cutting! LOL! That’s it from me today. Untiltomorrow, happy crafting. First of all, not one little tiny bit surprised at your response for the Facebook group; apparently there IS room for one more, when Jan B's name is attached! 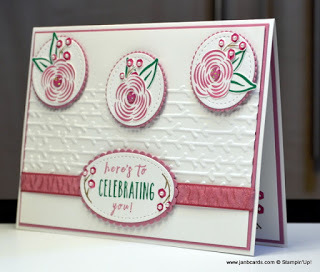 SO happy for you, Jan. And now the card … I've barely touched this one yet myself and there's so much that I like about it, but you've found your way around the challenge of the black "berries" just brilliantly! Love the clean and simple look of this card and the clarity of the colours you've chosen. Well done! Love it! Hi, Geraldine. 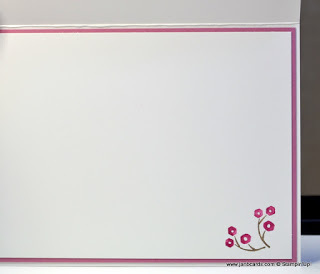 It never fails to amaze me how similar we are with our thoughts about cardmakingneg the black "berries". I'm glad you like how I dealt with them! LOL! ☺ Happy crafting. JanB. I love my Perennial Birthday stamp set. 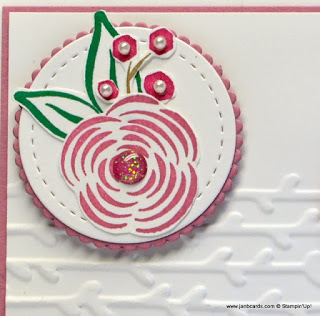 I first used it with the Perennial Birthday Card kit and loved the stamps. I know that a few are a bit tricky but it can be got around. 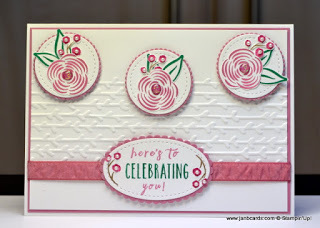 I have recently made a wreath template with the help from SU Demonstrator Sacha and I used my Perennial Birthday stamps with this. It was a great success. Hi, Lorraine. Have you shared it on Happy Crafting FB group? I'd love to see it! ☺ Happy crafting. JanB.